Tuition: Early registration tuition (ends 6/19): $500 $550 for HSLDA Members/$550 $600 for non-members. Description: In this course, students will develop a strong foundation in high school level physics through experiments, labs, discussions, lectures, and more. Physics w/ Lab will cover general concepts, such as kinematics, force, energy, momentum, circular motion, sound, waves, electrostatics, circuits, and magnetic fields. What topics will I learn about in Physics? In this course, students will explore the general concepts in physics. They will study kinematics in one and two dimensions, force, energy, momentum, circular motion, rotation, sound, waves, electrostatics, circuits, and magnetic fields. Students will study physics topics through various forms of instruction including, but not limited to, discussions, experiments, labs, lectures, practice examples, and videos. How much homework is in Physics? What books will I use in Physics? The official booklist for Physics is now available. In the official booklist, you will find information about the editions, book descriptions, and ISBN numbers. Am I ready to take Physics? Physics with Lab is designed for students in the 11th grade and above. Students must be able to read and write at a 11th grade level or above. Students do not need laboratory science experience before taking Physics. 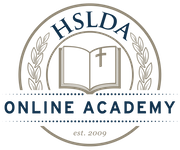 HSLDA Online Academy recommends that students have a strong background in mathematics in order to succeed in Physics with Lab. Students taking Physics should have previously completed an Algebra 2 course. We recommend completion of or concurrent enrollment in a Pre-Calculus & Trigonometry course also. Although all laboratory experiments are available for viewing by the students, performing the experiments at home with adult supervision is strongly recommended for a broader and deeper learning experience. Please also consult your state's high school graduation requirements, to ensure that your student is completing the work expected of high school students in your state. What is a Live Online Class Session in Physics? What if I have a schedule conflict with listed Physics class times? What is the tuition for Physics?